Have you ever wondered how you can take your child’s LEGO obsession and turn it into a way for them to learn even more? 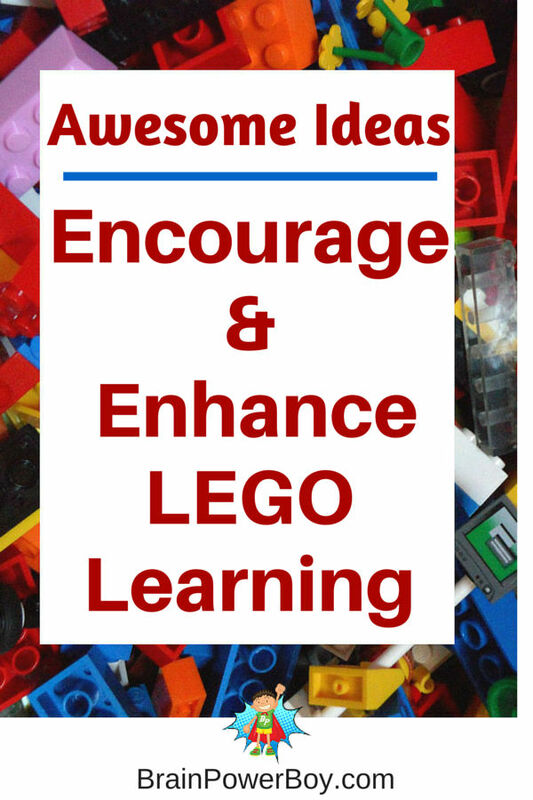 Today we are talking about ways to encourage and enhance learning with LEGO. LEGO is a natural learning tool but you can help them even more by following the tips below. We have several other LEGO Learning ideas here on the site as well and are planning to add more. Use these tips and you will be helping your child learn in a fun and engaging way. If you have been reading this website for a while you know that we are huge LEGO fans. 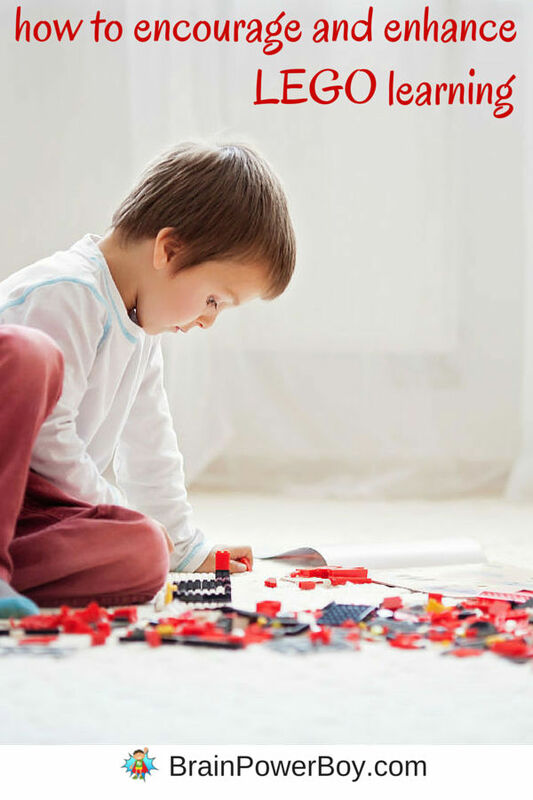 There are many learning opportunities through LEGO play such as: creativity, patterns, construction techniques, working in 3D, spatial reasoning, problem solving and more. I am suggesting taking that general learning and finding a few worthwhile ways to encourage and enhance it. Your child is already into LEGO and you can take his learning with LEGO even further with these simple ideas. When we can encourage them in their learning through a toy with big appeal it is a win-win situation. Try these simple ideas to take LEGO to the next level. All of them are easy and they all help boys to move forward with their learning. Give them plenty of time to play. Playing with LEGO is a wonderful way to learn – read more about it in What They Learn When They Play. Leave them alone 🙂 Seriously, don’t interfere. Let them dump out the LEGO and build. Be there if they need you but let them play their way. Give them freedom to build whatever their little heart desires. We want them to develop their building skills but just as importantly their creativity and imagination skills. Help them to be comfortable making mistakes. Make sure they understand that mistakes lead to learning and new ideas! Let them try a few LEGO Designs which allow them to follow directions. Have them play around with the design to make it their own. If they want you to play with them, design things together. Try to make trees, or a house, or your pet. Spend time playing with them. It doesn’t matter what the end result is as long as you are playing around, learning with LEGO, and spending time together. Buy more bricks ! Yes, I know you are likely cringing as you hear this but the more bricks they have, the more they can create. Click the link to see our favorite add on right now- we are loving it because it has pieces we didn’t have before. Including eyes! In addition to more bricks, get more elements. These are specialty pieces like hinges and plates. You can get them here. Take them to LEGO Events. Get LEGO books and leave them laying around. Delve into LEGO Robotics and invite your boys to learn with LEGO in a new way. Create with LEGO online by using the LEGO Digital Designer (free download) then try to build the sets in real life. Make your own LEGO animations. Learn new techniques together. Our favorite book for learning LEGO building techniques is The Art of LEGO Design. <<This book is awesome! LEGO can be an incredible toy in and of itself. Just adding in a few things can take that wonderful toy and turn it into a very natural way to learn more. I hope this gave you ideas for encouraging and enhancing their learning with LEGO by doing a few of these simple things. The benefits are great and besides, LEGO is just a whole lot of fun! You’ve done it again! We keep our Lego downstairs in our family room to encourage the boys to play with it whenever. I’ve even caught my teen building with it while waiting for friends to show up online for a game they play together. Letting them play with no interference can make for some wonderful creations, and I always find I get a little peek inside what makes them tick when they show off what they’ve built. Thank you Alli! I love what you said about getting a little peak inside what makes them tick when you see their creations. So true. Thanks Erin – so glad to hear that. You do have a big LEGO lover! He does awesome builds. Really love this. I have been looking up more information about Lego and how it enhances a child’s mind and play. My son is in LOVE with Lego. Sometimes I worry that that is all he works with, but it is just that… work! He solves problems, creates simple machines and really enjoys his childhood! He is so happy I just can’t imagine our life without Lego! Surprisingly I have never stepped on one! I certainly hope it never happens because I have heard it is rather painful. Thanks for hosting your party – I enjoy linking up. I like the concept of playing with LEGOs with a goal in mind. My sons haven’t loved LEGOs as much as I expected them to, but maybe if they had a challenge they were working towards they would be more interested. Some kids never really take to them and that is, of course, fine. Perhaps they would prefer a different building material. I will say that LEGO challenges can be a lot of fun. Thanks. We certainly agree that LEGO is a fantastic toy! Thanks Sarah. I should share my quick cleaning method some day. I agree that they are totally worth it. I love Legos and letting my kids have freeplay with them. Your idea of adding on to legos with Lego robotics is perfect for one of my sons. His birthday is coming soon and I think that will be his big gift. great ideas! We have a Lego store in one of the malls and we visited just for bricks once. My son filled a small container with a whole bunch of just bricks, love that he did that!! More to create with…..
Oh how lucky you are Susen! I wish we lived near a store with a pick-a-brick wall. It is a wonderful way to get some neat pieces. This is great advice – and I love how playing with LEGO can help them learn real world skills too! Yup, LEGO, toys, games . . . all the things kids use in play are just part of life learning. We have two girls in our house who love playing with lego and creating. They are quite different in their creativity than boys (I have 3 brothers and 1 sister and we wore our lego out!). I have noticed how they are somewhat inhibited when adults play/take over and I am encouraging the adults to let them create by themselves, so your article has helped educate us all in our house. Thank you.